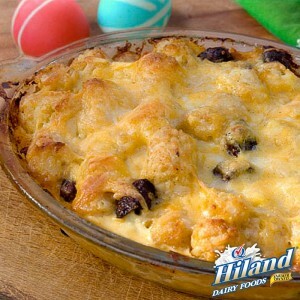 In between Easter baskets, egg hunting and Sunday celebrations with family and friends; this Easy Breakfast Casserole is a dish everyone will love. Packed with 36.5 grams of protein, it’s also a great way to stay energized. And talk about easy to make. Here’s all you need to do to be ready. Preheat oven to 350°F. Lightly grease a 9×12 baking dish. Mix all the ingredients together in a bowl. Pour into the prepared baking dish. Bake for 45 to 50 minutes, or until set. Slice and serve.